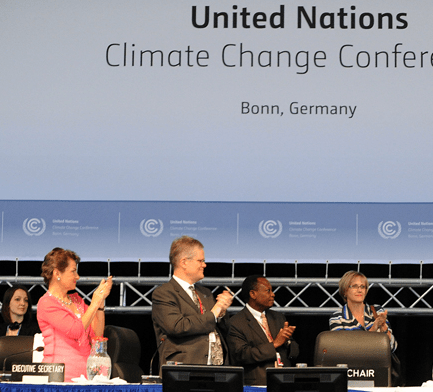 You wouldn’t know that from the UN climate negotiations that took place in Bonn from 14 to 25 May 2012. “There is a total stalemate,” said Artur Runge-Metzger, the chief negotiator for the European Union. Of course this is nothing new. But previously when there was little or no progress in climate meetings REDD proponents could point to REDD and claim that at least some progress was made. But after the Bonn meetings, even that wasn’t possible. Finance was one of the items on the REDD agenda in Bonn. On 19 May 2012, a spin-off group under the Ad Hoc Working Group on Long term Cooperative Action (AWG-LCA) met to discuss how REDD should be financed. Third World Network produced detailed notes of the meeting, posted below in full. Bolivia, Sudan and Tanzania made statements rejecting offsets and market finance. Brazil said market-based approaches should exclude offsets. India said conservation of forest carbon stocks should not be financed by market mechanisms. Papua New Guinea, Mexico, Indonesia, Ghana, the Philippines and Guyana asked for REDD financing from the Green Climate Fund (GCF) together with a new market mechanism. Norway agreed and referred to the importance of the safeguards and MRV discussions under SBSTA. China said finance should be mainly public but is open to other sources too. The United States supported REDD funding from the GCF but said it is too soon to decide and that the GCF has to make that decision. New market mechanisms should be discussed further in 2012. Australia agreed. The European Union said that REDD funding is related to other negotiations (finance, Nationally Appropriate Mitigation Actions and new market mechanisms). Switzerland agreed and said further negotiation is needed. PNG said most REDD-readiness has now been completed. All that’s missing is financing REDD activities. The Forest Carbon Partnership Facility, UN-REDD and the REDD-plus Partnership should be shut down to be replaced by the GCF and the REDD-plus mechanism (under the UNFCCC). The Philippines disagreed. Japan wants various financial options and mentioned sustainable forest management in REDD countries. Thailand and China said there should be equal access to financial sources. The discussion was summarised in an “Oral report to the Contact Group”. The Secretariat will produce a technical paper and a workshop is to be held later this year. Bonn, 22 May (Hilary Chiew) – Parties differed in their views on the use of private finance for forest-related activities at the spin-off group under the Ad Hoc Working Group on Long term Cooperative Action under the Framework Convention on Climate Change (AWG-LCA) to discuss the financing system for ‘REDD-plus’ on 19 May. While most countries that made interventions preferred the use of both public and private funding sources and favoured the market-based approaches, Bolivia, Sudan, Tanzania and India differed, particularly in the use of offsets within these market-based approaches. The forest related activities, known as ‘REDD-plus’, cover reducing emissions from deforestation and forest degradation in developing countries, the role of conservation, sustainable management of forests and enhancement of forest carbon stocks. Bolivia pointed to its proposal on the idea of joint mitigation and adaptation approaches that is reflected in paragraph 67 of Decision 2/CP.17. It said there is no doubt that in the context of REDD-plus, the development has been related to the carbon market and mitigation. It warned that Parties must be careful of the temptation to move automatically to market against non-market and that to move forest towards the non-market approach is imperative. It said to start this non-market approach requires moving the thinking on mitigation to incorporate both mitigation and adaptation, moving from carbon to the multiple benefits of forests, thus applying what integral development means in practice. Stressing that this approach is closely related to a sustainable reduction of emissions and has a lot of co-benefits, Bolivia said the challenge from now until the end of the year is to move work towards non-market approaches and linking forests to public funding. Sudan rejects offsets and requested for major sources of public funding. It said MRV (measuring, reporting and verifying) of funding must be provided for the implementation of the third phase of results-based action with full implementation of direct and indirect benefits. Tanzania said Parties are deceiving themselves if they think that finance is coming from the market. It said the Durban decisions has not changed the principles of the Convention which said that large share of finance should come from the public sector. It highlighted that the financial mechanism for REDD-plus should take into account that drivers of deforestation differ from one country to another. In the LDC (Least Developed Countries) context where 80% of the biomass are needed for food security, the drivers of deforestation are linked to needs of local communities. It warned that market-based approaches cannot address this type of drivers of deforestation. India said conservation of forest carbon stocks need to be incentivised through non-market based mechanisms and not through market-based mechanisms and that there should be a proportional distribution among the activities between (a) to (e) (referring to paragraph 70 of Decision 1/CP.16 on the five specific activities of REDD-plus). Papua New Guinea said most of what is needed to start REDD-plus activities in developing countries has been achieved since Bali (in 2007). It said it is determined to finish work since Durban (referring to COP 17 at the end of 2011) and the key missing element is the implementation of financing REDD-plus activities. It asked for a dedicated window for REDD-plus financing in the Green Climate Fund (GCF) and new market mechanism for results-based actions in phase three of implementation with a measuring, reporting and verifying (MRV) process at national level. It believed it will be most useful to coordinate the current session with synergy with the GCF and non-market mechanism. It also suggested that the existing financing mechanism under the various processes like the World Bank’s Forest Carbon Partnership Facility, the UN-REDD, and the REDD-plus Partnership be replaced as soon as possible by the GCF and the REDD-plus mechanism (under the Convention). Guyana said any vision for a 2°C goal can only be achieved if REDD-plus is part of the solution. It said that many rainforest countries depend on their forests as a source of finance for growth and development, and to ensure that we need to incentivise the sustainable management of forest. And because of the scale of finance, no single source can do the job hence the logic of the Durban decision that says both public and private. It suggested that public financing should be channeled to the GCF and believed that private sources can be utilised for both market-based and non-market approaches. For market-based approach, financing can be generated through auctioning of assigned amount units (AAUs) and it would prefer a new market mechanism under the guidance and authority of the COP. It would also support REDD-plus bonds and advance market commitments. It believed that payment for results-based actions should be subjected to a robust accounting system and it saw merits in linking the discussion on finance with existing finance discussions elsewhere (referring to the GCF). Norway agreed that REDD-plus is an important part of the solution to combat climate change and that lack of finance for it will threaten its implementation. It said at Durban, Parties agreed that results-based finance for REDD-plus must come from a wide variety of sources including from market-based mechanism with environmental integrity preserved, safeguards addressed and respected, and a robust MRV system. It said at Doha (venue of COP18 at the end of this year), a national, results-based financing mechanism for REDD-plus must be established, adding that increasing finance in Doha will increase momentum of countries to take action. It also suggested a REDD-plus window in the GCF for payments for emission reductions, rewarding countries for taking action. Norway added that Parties must also make progress on the architecture for REDD-plus to provide rules and regulations in ensuring environmental and social integrity, and that guidance from SBSTA (Subsidiary Body on Scientific and Technological Advice of the Convention) on technical issues such as forest reference level and MRV of results and how safeguards are addressed and respected is important. It said there must be clear signal that significant finance will be available for the period 2016 to 2020 and REDD-plus must become part of the global agreement after 2020. Mexico said any Party should be able to access a combination of market and non-market based incentives. It said before participating in REDD-plus, Parties should establish a national REDD-plus registry to verify carbon stock enhancement and emission reductions. The registry can be used to ensure that the REDD-plus emission units have not been used for compliance purposes elsewhere and that this information can be transferred to the UNFCCC. It said the GCF should finance results-based actions and that Parties should receive monetary incentive for REDD-plus units, adding that adequate and predictable funding is critical. Mexico also said that public funding alone is insufficient, therefore, REDD-plus units outside of the GCF can be used for compliance from 2013, adding that any transactions outside the GCF should be reported to the registry to reduce the risk for private investment. Increased direct funding for results-based action should be provided by the GCF as well as other bilateral and multilateral funds, it added. Indonesia said many developing countries have started REDD-plus activities both with international funding as well as domestic support. It acknowledged that success of REDD-plus implementation also depends on success in addressing drivers of deforestation. It felt that public fund itself cannot support all the actions needed by developing countries, and that funding from the GCF should be made available for all phases of REDD-plus activities implementation. It also said that a new mechanism should be used for results-based actions. MRV and a safeguards information system should be in place. As long as MRV of SIS (safeguards information system) and other systems for reference emission level are in place, it should satisfy the requirements for results-based payment. The European Union said it is here to develop financial mechanisms to support full implementation of results-based actions. Halting forest cover and carbon loss by 2030 at the latest would require broad participation of countries and it would also support bio-diversity protection and other benefits. The results, it said, will have to be assessed against independently reviewed and UNFCCC approved national reference level and Parties will have to develop some sort of baseline for provision of results-based actions, taking into account national circumstances. It pointed out that the discussion is related to other negotiation groups including finance, Nationally Appropriate Mitigation Actions and new market mechanisms, adding that the concept of baseline differs from the concept of reference levels. It said there is the need to encourage financial entities and other public and private entities to apply these results-based procedures when financing REDD-plus. It also invited the private sector to work on addressing the drivers of deforestation. Switzerland agreed that a variety of sources is needed. It said funding needs to be harmonise with other mechanisms of the Convention such as NAMAs and Parties need to define modalities for governance before they get to market-base sources. National governments need to build the enabling environments for REDD-plus implementation including safeguards being addressed, capacity-building is provided and working with private sector to generate and secure finance. It said that further negotiation is needed on how each of the sources of finance identified at Durban is to be mobilised in Phase 3 of REDD-plus. unlock the significant contribution of REDD-plus. Parties need to use this moment to think strategically about the coming years especially in relation to operationalisation of support for results-based actions. With regards to appropriate market-based and non-market-based approaches, it said discussion this year should enhance understanding of Parties before engaging in the consideration of financing options, adding that appropriate market-based approaches should exclude the use of offsets. It hoped a technical paper and a workshop would help deliver on what has been mandated. Ghana said there is need to obtain adequate and predictable finance for full implementation. National REDD-plus activities, demonstration projects and scaling up of activities will have to be financed for effective implementation. Crucial systems such as national forest monitoring system, MRV, forest reference level, development of safeguards information system as well as identification of drivers of deforestation will all require financial support. It further said a flexible combination such as a dedicated window for REDD-plus through GCF, market based and non-market based approaches are needed for sustainable support for REDD-plus. China emphasised two main aspects of REDD-plus: the source of finance and secondly, modalities and procedures. It stressed that finance for results-based action should mainly come from public sources but is open to exploring the other sources. It said all actions and activities defined should be provided with equal opportunities to access the finance. The Philippines supported the call for a REDD-plus window in the GCF and that the finances should include all phases of REDD-plus and not just the last phase. It said all processes of developing REDD-plus activities from the development of the national forest monitoring system, MRV system, safeguards information system as well as addressing drivers of deforestation have to be supported financially as most tropical forests are found in countries with low income. Reacting to Papua New Guinea for the termination of existing REDD-plus activities, it said at this point in time it is hard for the Philippines to support the proposal as it has only started its activities and furthermore it will take a while for the GCF to support REDD-plus activities as it is not in full operation yet. It pointed out that the uneven development of REDD-readiness projects and many countries are only at the initial stage of implementation should be recognised. The Philippines said it will support the participation of civil society and indigenous peoples as observers in the GCF. The United States said it is premature to decide on a REDD-plus window in the GCF as the decision has to be made at the GCF although it supports the idea. It also said a broader market structure should be developed and new market mechanisms should be discussed further this year. Australia was of the view that public finance in this trying global financial time will be insufficient, hence it is advocating market as part of the solution. It felt that private finance is one of the key factors that has to be brought in, particularly for Phase three. On tapping into GCF, it said it would be good to revisit the option after the GCF is operational. Japan said experiences gained from demonstration activities should be used to guide the development of MRV and the safeguards information system, adding that various financial options will be effective to cater to the diversity of national circumstances. It also called for a technical paper to be prepared by the Secretariat. For better understanding of REDD-plus, lessons learnt including sustainable forest management in REDD-plus countries will be helpful. Thailand also would like a technical paper and said that there should be equal access to financial sources. Civic Watch, Ghana said forests are more than carbon, and are home to forest peoples and biodiversity and play a key role in adaptation. Modalities and procedures for results-based actions for REDD-plus must therefore include financing actions, which preserve and enhance all of these other benefits of forests. Results are more than carbon, including in phase 3 when offsets should not be used to finance REDD-plus activities. Kate Dooley of FERN said she was pleased to hear many Parties referring to the 2°C goal and the need to maintain environmental integrity. She pointed out that, from a carbon cycle perspective, reductions in emissions from the terrestrial carbon pool can never offset or compensate for increased emissions from fossil fuel reserves. To meet the 2°C goal, reduction in emissions from deforestation and forest degradation must be additional to steep reductions in industrial emissions from developed countries. Therefore “appropriate” market mechanisms for forests must exclude offsets and focus on the range of market-linked and innovative finance, which can be used to supplement public funding. Chair Yaw Bediako Osafo of Ghana said he would report to the AWG-LCA Chair Aysar Tayeb but he was unsure if there would be another meeting of the spin-off group. UPDATE – 4 June 2012: Quotation from Fatih Birol corrected. See corrected Reuters article here and a discussion here. At least it seems carbon offsets as a financing mechanism for REDD are no longer in play. That is good news and real progress. To adapt an old simile, it strikes me that what is happening is that the various governments are now locked in irresolvable argument about the best way to re-arrange the deckchairs on the sinking ship. PNG, meanwhile, with its ‘most REDD-readiness has now been completed’, is still in firm denial that we’ve struck an iceberg. @Michael (#1) – I’m not sure that it’s true that REDD carbon offsets are no longer part of the discussions. I think the “new market mechanism” that several countries talked about could well include offsets. @TreeFellas (#2) – I don’t think PNG is in denial. I think PNG has noticed that the UN-REDD, FCPF and REDD+ Partnership boats are sinking (or at least aren’t going to pour large sums of cash into the PNG government’s coffers any time soon). So PNG’s cunning plan for cashing in on REDD is to jump into the GCF lifeboat (which hasn’t been built yet). The FCPF has lost both its helmsman and the wind in its threadbare sails. The World Bank has left the sinking ship for a wreck which it is trying to make seaworthy – large-scale infrastructure projects.